Luminosity Beach Festival 2014 – Line-up Reveiled! Luminosity Events is proud to present the Luminosity Beach Festival 2014 line-up! The winter has barely started or a new Luminosity Trance Gathering event is already there to warm you up! For the first time in Luminosity history we have a Valentine’s Day Special. We are pleased to reveal that Luminosity Trance Gathering (Before ASOT 650) will take place at the Westerunie & Westerliefde venue in Amsterdam on 14-02-2014. A Trance party at Valentines, to celebrate this beautiful “Valentines Night” with your loved ones. 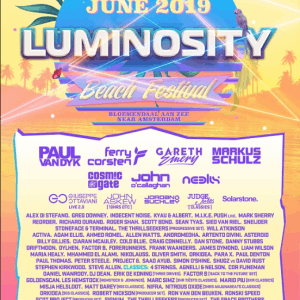 Luminosity Beach Festival is BACK for its seventh consecutive year and will return to Beachclub Fuel in Bloemendaal for a special three-day event from July 4th to July 6th, 2014. Luminosity is here to warm you up from those cold winter winds with news on the best beach event in The Netherlands! Luminosity & Perfecto Fluoro @ ADE WesterUnie has sold out! The last 100 tickets will be available at the door or via e-mail reservation via info@luminosity-events.nl. On Wednesday October 16th, Luminosity will experience its first ADE edition. Check inside for the full line up including time table! Luminosity will be hosting two areas at this great venue. 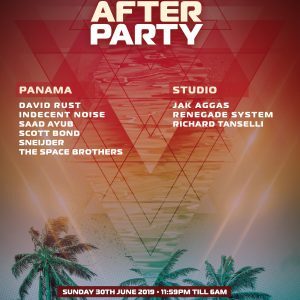 The main area will be hosted by the Perfecto Fluoro label, including trance legend Paul Oakenfold. The line-up of the 2nd area is hosted by Luminosity and a proper banging trance mix of established and fresh DJs! Luminosity @ Pleasure Island: Almost sold out + timetable announced! The 15 hours tickets for the Pleasure Island Festival on August 31st are going fast! Real fast. Tickets update: we have managed to expand the dance floor towards the beach, this to create extra capacity to receive more die hard trance party people at our lovely beach. Tickets for both days are available at the door entrance, there are still plenty available. Please note that the exact pickup point of Rembrandtplein has been confirmed as the Eden Hotel at Amstel 144, on the backside of the Rembrandtplein. Luminoity Events today announces the confirmed pickup locations and schedule. There will be special party bussen from multiple locations in Amsterdam transporting you party people directly to Bloemendaal beach. Please see below the time schedule per pickup point.